As outsourced Chief Investment Officer (“OCIO”) solutions become more popular with institutional clients, the need to compare firms on a quantitative basis grows greater. 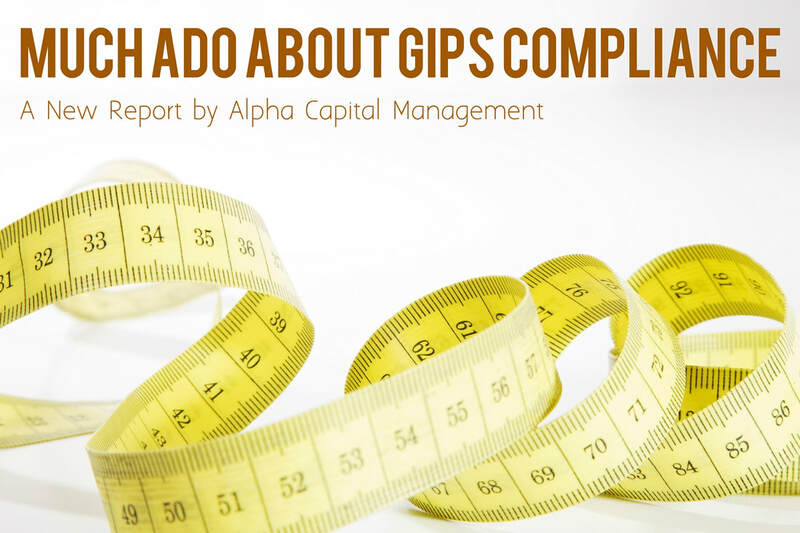 If you’ve spent any time talking about the OCIO model with Alpha Capital Management, you’ve likely heard us mention GIPS compliance as an issue. Performance is one important way to draw clear comparisons between investment managers (though, of course, it is not the only factor to consider). Most investment managers in traditional asset classes, especially those who work with institutional clients, claim compliance with Global Investment Performance Standards (GIPS), a globally accepted methodology for calculating and presenting performance information. Prospective clients are able to directly compare investment manager results to measure skill (i.e. alpha). GIPS is not as common yet in the alternative investment space, although that is expected to change in the near future with many hedge funds working toward GIPS compliance. The CFA Institute has been working on a project called GIPS 2020 aimed at improving the standard and increasing adoption, and it is expected to propel adoption of GIPS among alternatives managers. We hope it does the same with OCIOs. We request performance information in our RFPs, but it is a highly imperfect metric. Traditional investment consultants are not usually compliant with GIPS, and performance varies widely between clients due to varying investment policy restrictions, use of alternative assets, individual investment managers, and whether the client implements the consultant’s advice. Many firms provide us with representative account data, which may or may not be relevant to our client. Although some OCIOs invest client assets as a pool where it is very easy to show audited performance, customized OCIO providers face the same issues that traditional consulting firms do: clients have different investment restrictions, different managers, and different objectives. GIPS is an established set of principles that standardize the calculation and reporting of investment performance. The GIPS standards are voluntary and based on the fundamental principles of full disclosure and fair representation of performance results. GIPS allows investment management firms to quantify and communicate their performance without misrepresentation. Reference the Global Investment Performance Standards Handbook from the CFA Institute for more information on the standards, which is available for download at the CFA website. Any investment management firm can follow the guidelines set forth by GIPS when calculating its track record, but only firms that manage discretionary assets can claim compliance with GIPS. Compliance cannot be attained by a single product. A firm must follow all requirements of the GIPS standards across all of the firm’s products, or else it may not claim compliance. Moreover, each and every client must be included in one of the composites. The CFA Institute’s GIPS Standards website lists more than 1,500 firms who claim compliance. To date, few OCIOs are among them. Why is GIPS Compliance Useful for OCIO Searches? Simply put, an institution’s ability to judge the OCIO’s ability to beat their benchmark over time, with comfort that the numbers are not cherry-picked or massaged, is paramount in selecting a qualified OCIO. There are several complicating factors to consider, however. Some OCIOs use “building blocks,” where they establish track records for asset class composites like global equity. Examining those records helps gauge skill in manager selection (and to some extent, the ability to combine managers). But what about asset allocation? Unfortunately, looking at building block records doesn’t show if an OCIO has skill in asset allocation, either strategic or tactical. A true GIPS composite gives the institution valuable insight into the ability of an OCIO to manage a total portfolio. GIPS compliance also helps to compare firms on an “apples to apples” basis. In the searches Alpha Capital Management runs for large institutions, we receive performance information that is all over the map. Some firms send us gross numbers, many send us gross of their fee but net of the underlying manager fees, and very occasionally, we get “net-net” numbers (meaning net of underlying management fees AND net of any OCIO fees, representing the end client performance). GIPS would simplify this greatly. Exhibit 1 shows a sample GIPS compliant presentation. It is clear why this is valuable. Not only does the recipient have performance information, but he also has key information necessary to verify the quality of the data going into that calculation. There are some caveats. As discussed earlier, a firm claims compliance with GIPS. An individual strategy cannot be GIPS compliant; every strategy at the firm must be assessed and calculated in line with GIPS, and every account must be put into a composite. For OCIOs with asset management divisions, claiming GIPS compliance can be a very complicated, time consuming, and expensive endeavor. It also reduces a firm’s ability to be flexible in regards to how it shows performance, as it locks the firm into one set method of calculation (even for issues where GIPS allows some leeway, such as in the treatment of legacy client assets, the firm must choose a path and stick to it). There are also many flavors of OCIOs. Some OCIOs offer significantly customized solutions across their client base, while others offer a single pooled investment strategy that all of their clients use. For the latter, GIPS compliance is much more straightforward than the former. In our own OCIO searches, our institutional clients have been focused on performance as a differentiator between firms, and they have been frustrated by the complexity of analyzing the data they receive. This issue matters to the institutional investors who allocate to OCIOs and have the power to demand transparency. We believe that the client demand for transparency and comparability between providers will lead to GIPS standards being more widely adopted by OCIOs. We’re happy to see already that more OCIO firms are talking about GIPS compliance or making progress toward claiming compliance. Strategic Investment Group was an early adopter, as was Angeles Investment Advisors. Highland Associates and Aon recently announced GIPS compliance, and we have spoken to several other OCIOs or consulting firms who are in various stages of reviewing, calculating, or claiming compliance with GIPS. We firmly believe that the industry will reach a “tipping point” where the major players are GIPS compliant, and competitors must follow their example to stay relevant. The move toward transparent, verifiable performance calculations is a great thing for investors, and we highly encourage it. We applaud OCIO and consulting firms who have recognized this and are taking action. We hope to be able to exclude firms who do not claim compliance with GIPS or have audited numbers from our OCIO searches, but right now, there are not enough compliant firms to do so. As the OCIO industry develops, institutionalizes, and evolves, we think that adopting clear, verified standards of performance is the best possible way for institutions to differentiate between OCIO providers’ performance. We will do all we can to usher in this new era of transparency. Want to download a copy of this report to share? Click here. Are you thinking of engaging a search firm to help you run a consultant search or OCIO search? You’re not alone. Although practically unheard of five years ago, the outsourced CIO (“OCIO”) model, in which a committee hires an investment manager to oversee the portfolio rather than soliciting advice from an investment consultant, has exploded onto the institutional landscape and has garnered significant interest from a wide range of institutions. The investment world has gotten increasingly complex, and more and more boards, committees, and organizations are unsure of their ability to truly fulfill their fiduciary obligation to the assets they oversee (at a time when fiduciary lawsuits are on the rise). OCIO models offer a solution for organizations struggling with a lack of internal resources, a desire to improve governance process, and the need to improve risk-adjusted returns. The traditional investment consulting model has evolved to fill these needs, but at the same time, it has complicated the investment advice landscape. This added complexity has led to a new niche service provider: the consultant or OCIO search firm. These are sometimes referred to as “OCIO Search Consultants,” but we believe this terminology is confusing as consultants historically provide investment advice while OCIO search firms provide very targeted services to enable organizations to vet investment advice and implementation providers. We like to say, “don’t call us a consultant!” OCIO search firms exist to guide organizations through the search process, everything from designing the RFP and developing search criteria to identifying candidates and analyzing the responses. More than one-third (34%) of providers polled in a recent industry survey by Cerulli used a search firm, and this number continues to grow. They manage the entire project from start to finish, greatly simplifying this important fiduciary process for institutions. It may seem silly to go through an RFP process to hire a firm to run your RFP process, but as a leading search firm, we often receive “mini-RFPs” with a handful of questions designed to compare us against our competitors. As RFP architects, it makes sense to us from a due diligence perspective. We encourage firms to consider this exercise, and to help, we compiled 10 sample questions that organizations can use to learn more about search firms. Briefly describe your firm’s history and ownership structure. Describe your core business focus. What are the primary client types for which your firm provides consultant search services? How many searches have you performed in the past 2 years and for what types of asset pools? Provide 3 references from recent searches. Do you have any compensation agreements with any investment consultants, OCIOs, or money management firms that you include in searches? Are any such firms clients of your firm in any capacity? Do you provide investment consulting or OCIO services to institutions? Provide an overview of how you propose to lead our organization through the process, including identification of potential candidates, development of the RFP, and the review and evaluation of responses. Include a timeline. Provide brief biographies of key professionals that would be responsible for working with our organization. Describe your client service philosophy. What are your competitive advantages? What are your limitations? Want to see our answers? Email us to request our due diligence questionnaire. Download a copy of our search consultant RFP to share with colleagues. What is this stock market volatility telling us? The past 5 days have tested the fortitude of any investor. The decline Monday of 1,175 points in the Dow was the largest one day point drop in history. The Dow had never lost more than 777 points in a single day. But in percentage terms, the declines of Monday and Thursday are nowhere near the worst. On Black Monday in 1987, the Dow dropped an incredible 22%. That is the equivalent of a 5,250 point decline today. Nobody likes volatility, but especially not downside volatility. Investors were lulled into a false sense of security as the S&P 500 was up every month in 2017 for the first time in history. Remarkably, we’ve gone nearly two years without a 5% drop in the market. Bloomberg created this fascinating chart showing the least volatile ten years of the US stock market since 1945. Those years were followed by very volatile years but still ended positive the majority (6/9) of the time. 2017 was the second least volatile year over this 73-year time period. S&P 500 companies’ revenue growth has been very strong for the fourth quarter of 2017, as reported so far. As of last week, about 70% of companies reported higher than estimated revenues for the last quarter of 2017. The stock market has always been volatile, but most investors have forgotten this fact. Investors need to embrace volatility, as it is healthy for the market to cleanse the system of speculative investors and excessive leverage. If you can’t stomach daily volatility, then you might want (or need) to re-examine your portfolio. But to be a long-term investor in the stock market, you must embrace it. For most institutions, running an investment consultant RFP or OCIO RFP is an occasional (and painful) process. There isn’t much value derived from previous RFPs since the intervals are too far apart. Offering this as a service, we have an opportunity to constantly improve and evolve our search process, including the questions in the RFP themselves. It allows us to pinpoint what works and what doesn’t. With that in mind, here are five of our favorites. Update: we're pleased to announce that this report was featured in FundFire on December 15! Download your copy here. 1. What percentage of firm revenue comes from institutional consulting activity? Identify other sources (and %) of revenue. Rationale: The lines have been blurred between investment managers, consultants, and outsourced chief investment officer (OCIO) providers – especially over the past few years. Although we typically include many questions in an RFP designed to identify potential conflicts of interest, this question gives us a birds-eye view of the firm’s revenue. We use it as a way to gauge the firm’s commitment to providing traditional consulting services versus OCIO services and/or investment management services. It also alerts us of existing business lines that we may not have captured in other questions and allows us to clarify this in conversations with the respondent. 2. What is the average client-to-consultant ratio at the firm, and how is it calculated? Rationale: It was an investment consultant who clued us into the various ways this question can be answered. Some firms simply compare the number of clients to the number of investment professionals to calculate the ratio (thus including dedicated research professionals and support staff along with client-facing consulting professionals). Others only include consulting team members. One firm differentiated between lead (counted as 1 client) vs. co-lead (counted as 0.5 clients) relationships. In order to compare firms on this metric, it is important to get consistent responses and to understand how this metric is being calculated. We ask several questions about the client to consultant ratio, but this is the primary one we use for comparison. 3. Provide comments and suggestions on our current Investment Policy Statement (included with the RFP). Rationale: What better way to evaluate a new advisor than to ask for advice in the RFP? When a new consultant is brought on board, the first step is often a review (and possibly, an overhaul) of the organization’s existing investment policy statement (IPS). Most of the time, these changes are cosmetic – for instance, a particular consultant may prefer wider bands around target allocations. But we have seen a few cases where prospective consultants identified potentially serious issues in a client’s IPS, including internal inconsistencies. Even if the organization stays with the incumbent, this question gives the organization comfort in the integrity of their IPS and documents a thorough review process with input from some of the best minds in the business. 4. How do you ensure best ideas are shared between consulting and research teams? Rationale: The bigger the firm, the more likely it is that there are consultants and researchers spread across different departments and different geographic locations. The best research capabilities in the world won’t do a client any good if the consulting team isn’t receiving, processing, and funneling this information to the client. Ensuring that there are strong processes and procedures in place to keep these lines of communication open is a way of ensuring the client benefits from the full capabilities of the firm. 5. How do you measure your success as a consultant? Provide data as support. Rationale: Much as our firm is constantly evolving and improving our RFP questions, consulting firms are evolving and improving their responses. They have carefully crafted qualitative answers to show off their skill set to the best of their ability. This question is a way for the client to quantify each firm based on the results of their advice (not an easy thing to do with consultants!). It also provides insight into what the consultants themselves think is important, which can be very helpful in setting criteria. What is the average client to senior consultant ratio for relationships in the following size ranges? Rationale: Where questions are open to interpretation and gamification (such as the client to consultant ratio), we request different data points and ask for the information in different ways. This allows us to cross-reference the responses and ensure that the answers are consistent. We used this question (unsuccessfully) in a recent RFP. We expected to see a higher client-to-consultant ratio on smaller clients (with AUM representing a crude measure of complexity) and a lower ratio on larger clients. Overall, the measure should be in line with the high-level client-to-consultant ratio. 40% of the firms we asked didn’t track this data and most of the rest didn’t provide consistent information in line with expectations. One firm, for example, came back with 1:1 in every category, which we believe signified one senior consultant assigned to each relationship (i.e. the consultant to client ratio, rather than vice versa). Rather than try to reengineer this question, we simply removed it and rely on other measures to place the client to consultant ratio in context.